Well, happy Easter everybody! And what better way to celebrate than with a retro review of Billy Hatcher and the Giant Egg? Possibly the only SEGA-developed, vaguely Easter-related game we could think to review. But just how ‘egg-citing’ is Billy Hatcher after all these years? Will it be a ‘cracking’ adventure? Or will it come out with ‘egg on its face’? Sorry had to get those terrible puns out of the way, always nice to have a good ‘yolk’ now and then. Ok, I promise I’m done now. OK, so for those of you who don’t know what Billy Hatcher is all about, it’s a 3D platform game, developed by Sonic Team and released in 2003 exclusively for the Nintendo GameCube. At its time of release, Billy Hatcher received generally good reviews from the major gaming sites, being appreciated for good visuals and generally solid gameplay. 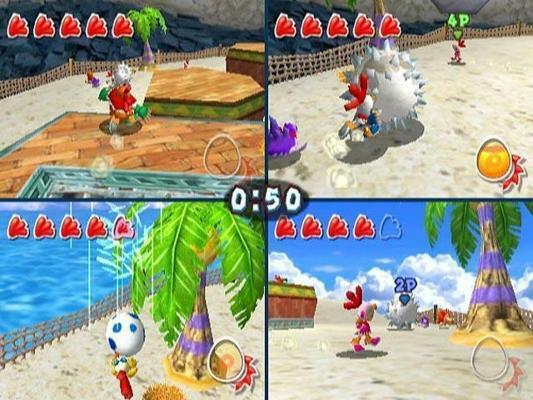 But it never really achieved the fame or popularity of many other GameCube exclusives and was totally overshadowed by the console’s other platform games, such as Mario Sunshine. 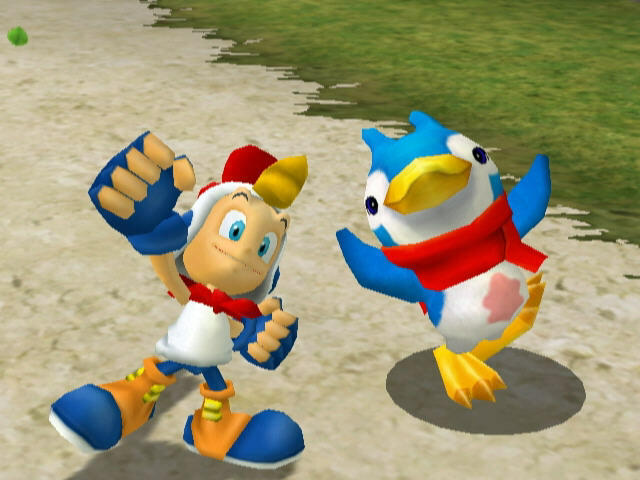 The story revolves around the main protagonist, Billy Hatcher (a very convenient last name in this case) a normal human kid who helps save a chicken from being attacked by some crows. Billy and his friends are then transported to Morning Land, a peaceful land inhabited by chickens. However, Morning Land has been invaded by Dark Raven and his army of evil crows. Dark Raven has captured the six Chicken Elders of Morning Land, casting the entire land into darkness. So it’s up to Billy to free the Chicken Elders and bring the morning back to err… Morning Land (yeah they could have come up with some more original names for things in this game). Soon into the game, Billy acquires his famous chicken outfit, giving him powers to control eggs and even hatch them. The majority of the game is played with Billy rolling an egg around the levels, but that’s because the many puzzles and ways of travelling around levels requires an egg – such as using blue and green hoops to push/fling Billy to higher platforms or far away areas. Without an egg in hand, Billy is actually pretty useless. He can run, jump and climb but has no direct attack of his own. Instead he uses eggs to roll over enemies, or (like a yo-yo) he can spin an egg at them and it bounces back. And you can jump and bounce with your egg to gain extra height or activate switches. Another way of attacking comes from ‘taming’ animals. As you kill enemies, different types of fruit come out of their bodies (don’t worry it gets even weirder) and as you roll your egg over the fruit, it ‘feeds’ the egg. As the egg gets fed it grows and once fully formed it starts to glow. As I mentioned, Billy can hatch eggs, so when an egg is fully formed you can get Billy to perform a rooster call and hatch the egg. Different eggs provide different hatches: some bring nothing, but others can bring extra lives, tokens, powers (which I never found out what they did) and also the aforementioned animals. Once an animal is hatched, all Billy needs to do is touch it and it becomes ‘tamed’ and will follow Billy around until either you die or finish the level. 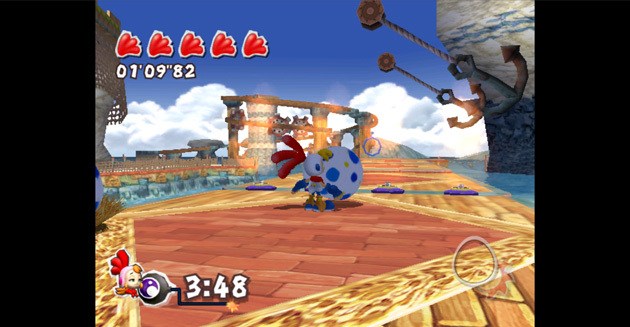 When Billy isn’t holding an egg, he can direct an animal in a single direction and the animal will perform its only move (which varies between animal type). 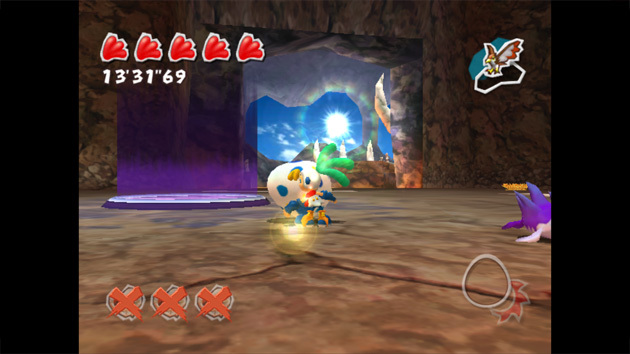 Animals become essential as they are used to solve puzzles, such as quenching flames blocking a path, as well as attacking enemies. Let’s face it, Billy Hatcher looks like a stereotypical GameCube title – bright, colourful, cartoon visuals with a kid hero and cute animals running around. So you could be mistaken for thinking this is exclusively a game for kids. While the gameplay is relatively simple and the controls are easy to grasp, the game is actually full of tricky moments that can bring even the most hardened gamers to throw their controllers at the TV. 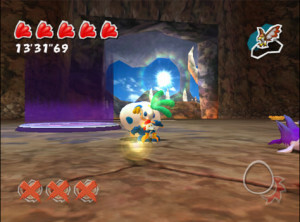 Each level is broken up into five main missions, with additional ones unlocked later on, the first two main ones on each level are the same – rescue the Elder (bringing sunshine back to that level) and then beating a boss. After that the other missions vary between rescuing other chickens, racing giant penguins and other random stuff. As I mentioned, most of the game is played with an egg in hand and the controls are pretty darn intuitive, meaning that it’s really easy to get into. 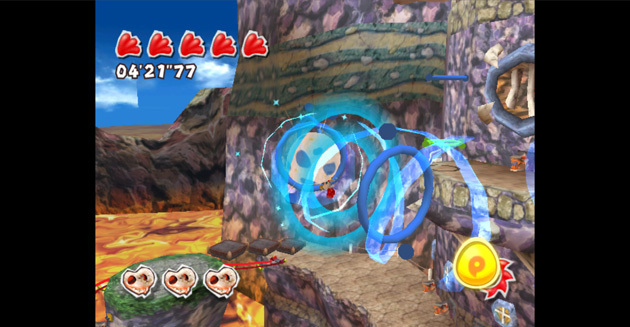 But after the first few missions, the game starts to showcase some of its more challenging elements. Things like jumping onto an egg and rolling it down a river might sound easy, but five lost lives later and I was ready to give up (and that was only the fourth mission in the game!). Or having to carefully roll an egg onto a rail and then quickly climb up a cliff face and jump down some awkward platforms and stop that egg from rolling off a cliff is definitely something younger gamers will find taxing. Another element to challenge players is protecting your eggs. Luckily the majority of missions don’t rely on your eggs surviving, but all eggs are prone to being damage or even destroyed by enemy attacks or environmental factors, such as lava. The few missions (it’s literally like 6 in the entire game) that do require an egg to survive can become quite intense and on other missions, while eggs are an abundance, should an egg become damaged it will negate your hatching potential: so essentially if you need to hatch an egg to acquire an animal or extra life then you don’t want to be too care-free with your egg. 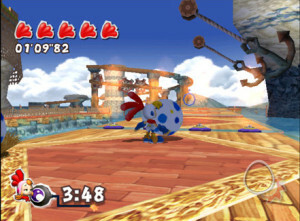 Though Billy Hatcher is a platform game at heart, the gameplay feels totally unique, as you push around eggs and use them to solve the various puzzles. 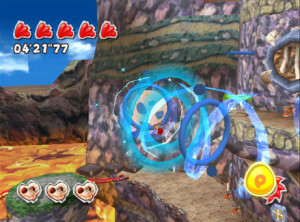 The levels are perhaps more linear than other 3D platform games, with stricter routes to take to get to the finish points and many missions prevent you from going back to sections you’ve already been in, but with each mission objective the level route changes, with new sections being opened and new areas to explore. Whether you like bright cartoon visuals or not, it’s hard not to be charmed by Billy Hatcher’s visuals; they hold up really well even today. Everything is clear and though some of the backgrounds look very flat and plain, the liquids (water, ice, lava etc…) and main environments are vibrant and attractive. While the different worlds feature cliché environments, they are varied enough to maintain interest and make players curious to want to continue to the next one. And one of the biggest complaints about 3D platform games over the years is the issue of camera angles and thankfully Billy Hatcher is in the minority where the camera angle is rarely a problem. All attention is focussed on Billy and his egg, with dynamic switching at just the right moments, but never so suddenly that you lose control (as what happens with many other games). You also do have free control of the camera, to look around at your environment and find hidden areas – but it’s really not necessary to even use the camera controls to get through a level and that is a very good thing – as all your attention is on the gameplay and not worrying that you can’t see round corners or what’s up ahead. There is also the case of music and sounds; I think you’ll either love or hate them. Personally I really enjoyed the music in the game, it matched the visual style and gameplay brilliantly and really gets in your head. However, I do understand that some gamers will be driven mad by a lot of the music – especially the main menu tune. As I’m typing this I can totally hear it… and it’s bringing a smile to my face. But, like all games, Billy Hatcher is not without its flaws. The difficulty is a really mixed bag throughout the game. Because of the visual style and simple gameplay, many gamers will expect a kiddie game and there are times where it really feels that way, as you breeze to a goal, rolling over enemies to the end. But then the game flips and the next mission you’ll be crying as a fiddly puzzle continuously causes you to die. Now, I quite liked the trickier missions, but it would be nice if the game maintained some form of consistency or gradually became harder (that’s what she said). Some of the missions are also uninspired. Considering the totally original gameplay idea and the fun environment designs, you’d think that Sonic Team could have come up with some equally unique missions to go through, rather than basic ‘beat the enemy’ or ‘collect coins’. Because of those lacklustre missions, gameplay does become tiresome at times. This is a disappointment, as the game has so much more potential than what SEGA/Sonic Team came up with. As I briefly mentioned you unlock additional missions, which are not played by Billy, but rather Billy’s friends (who are seen in the game’s opening cutscene and are also transported to Morning Land). Each level has five golden coins hidden in them, most of which are surprisingly well hidden, which (once all collected) allow players to control the ‘blue hedgehog’ egg… wonder what that could be, eh? Billy Hatcher was also one of the few GameCube titles to really make use of the GameBoy Advance link cable. Players can unlock GBA games such as Puyo Pop, ChuChu Rocket!, and Nights: Time Attack after certain objectives are completed within the game. To be honest, I never got to experience these GBA titles as I don’t have the link cable and haven’t used my GBA in about 8 years (don’t even know where it is!). But my understanding is that they are well worth the effort of unlocking. 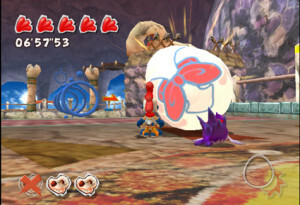 Perhaps Billy Hatcher’s biggest surprise though is that it offers a pretty damn engaging four-player mode, with a mix of games to play from a standard death-match to who can hatch the most eggs. Admittedly local multiplayer feels weird these days, but if you are able to have a few friends over, then it is well worth entertaining the thought of getting everyone involved in some Billy Hatcher action. The best thing is that because the controls are so simple and intuitive, pretty much anyone can pick up and play the game – even non-gamers. 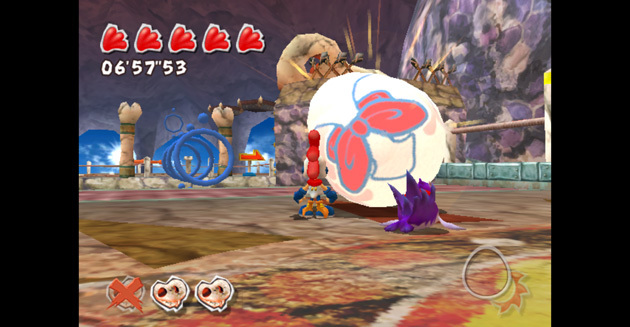 Billy Hatcher and the Giant Egg is a pretty deceiving game. It may look like it’s made for kids, but when you get into it you’ll find it has enough moments to challenge even experienced gamers. 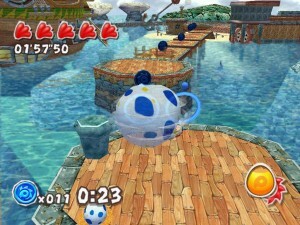 The gameplay is very unique and with simple controls, almost any gamer can happily pick it up and play. The presentation of the game is, again, simple but gorgeous. It does, however, have enough downsides to hold it back from being achieving true gaming greatness. Lacklustre mission objectives are possibly the biggest drawback, as it makes some of the game time drag out. And the varying difficulty level jumping from being too easy to suddenly very taxing can be annoying at times. But, at the end of the day, Billy Hatcher is an enjoyable game, with enough to keep gamers entertained. Just don’t let the cute, kiddie visuals fool you.